This weekend I took my two kids to our local splash park. The weather was a bit chilly, but I thought my oldest son might enjoy playing with the other kids. Oliver, 15 months, was a bit shy about going into the water. Not only was the water a little cold, but it also shot up out of the ground in an unpredictable manner. I stood on the side with Jack, 2 months, in a front-pack baby carrier. The water was definitely too cold for him to be exposed. 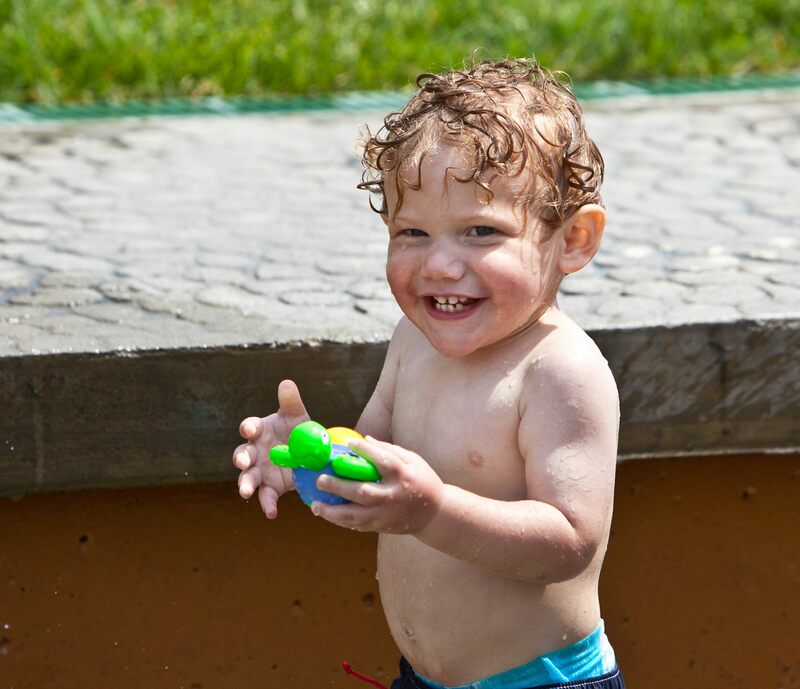 When Oliver just got brave enough to walk out into the water, a group of six-year-old boys started spraying him with water! They were incessant and did not quit when he started crying. Poor little Oliver just stood there shivering, lip-quivering, and crying, but they didn’t let up. I ran out into the water to help Oliver when those boys started spraying me (and baby Jack!). We got all dried off and loaded into the stroller when a trembling, teary-eyed six-year-old boy came over and told Oliver he was sorry for spraying him. My heart melted for this poor kid. He was visibly upset and I felt like maybe there is hope in this world. But, I did wonder why only one of the four kids had this kind of reaction. I don’t know where the kids’ parents were. I know that kids do silly things and this will be one of many instances when mama bear isn’t happy. But, wouldn’t it be nice if more kids were taught a little empathy? Or, if they were at least made to apologize when they scare the crap out of a baby? The way we raise our kids is the way they will act as adults. Don’t we want a little more courtesy in the world, or are we okay with a bunch of bullies? I had a similar experience this weekend at the same place. A grand mother brought two children, one older and one younger. She concentrated her time and effort on the younger one. The older one walked around stealing toys from various kids (that previous to him being there they had all shared peacefully), squirted kids in the face even when they told him to stop and pushed several smaller kids out of his way if they were in his way to whatever path he was taking. I really didn’t know what to do. Do you say something to the kid directly? Do you go the parent or grandparent? I was really, really glad when he left. I’m sorry to hear that, Michelle! I think we’ve all been that kid, and will probably (unknowingly) be that parent/grandparent at some point. So, I try to brush it off. But, it is really hard to know what to do at the time! Just be careful…bullying and just plain bad behavior are slightly different. Both are ugly however. Being a role model to your child…and being available to talk about different situations, is helpful. And never feel pressured to remain silent. It’s okay to speak up! It may not have even entered the minds of those kids that they were hurting O, despite tears. Many kids have a disconnect with empathy for others they don’t know…like a video game. Pack mentality. Remain hopeful that one kid apologized…that meant their was at least one adult who noticed, and spoke to that kid…and the kid responded appropriately. I’m. Ore worried for the other 5. Edit that “their” to “there”… And “Ore” to “more”. Good grief. Totally agree with you here. I’m glad at least one of the boys apologized. I’ve had two instances so far where much older children are mean to/bully Evelyn at the park. And their parents watched it and said nothing. One 4-year old girl pushed Evelyn down when she tried to enter a playhouse the little girl was in. The mother had the nerve to say to her daughter, “She doesn’t walk as well as you.” Um, WHAT?! I said, “No she doesn’t, but your kid pushed her, and that’s why she fell.” The mother shot me a dirty look and walked away. We can just strive to raise our little ones as courteous, thoughtful people. No. I am not OK with bullies and I am not OK with those kids parents not doing something. Teaching children empathy, especially for those who are weak, is very important. I am sorry this happened to Oliver.